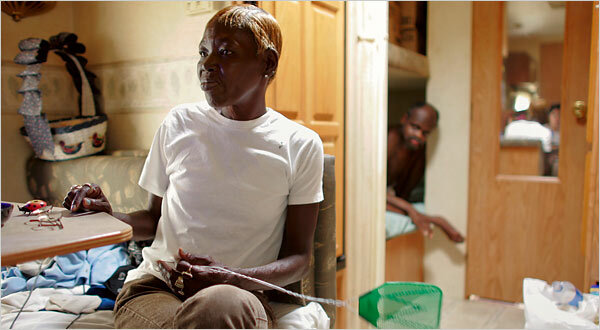 The caption reads: Gwendolyn Marie Allen lives in a Renaissance Village, a FEMA trailer near Baton Rouge, where she cares for with her son and her brother, right. This photo may seem somewhat indeterminate and also innocuous. Gwendolyn’s facial expression suggests that she is dissatisfied, but you have to peer into the image to see that. Otherwise, she seems poised and capable, flyswatter in hand; or at least so in respect to the scene behind her, which is blurred. The trailer also looks like it’s in good shape. What’s the problem? 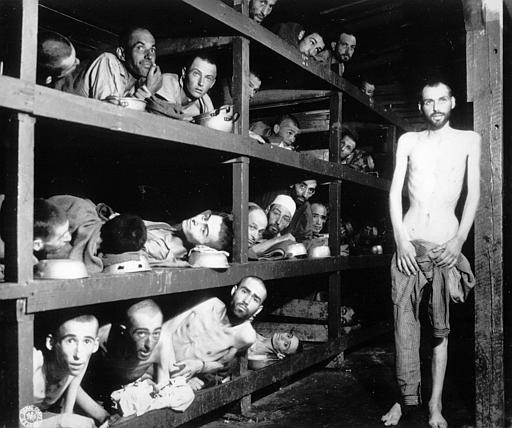 The template has been reversed on the horizontal axis, but again we see one more capable figure (the one able or willing to stand) and others staring out from the sleeping racks of the concentration camp. The allusion works in the other direction, of course: we are disposed to see the brother in today’s photo as if he were stacked along with others (perhaps Gwendolyn’s son, who is not seen) in one of the camps. Thus, the Times photo has smuggled in the Holocaust analogy for the Katrina disaster. There has been been heated debate about whether that analogy should ever be made, much less in respect to Katrina, and in this case I’m on the side of those who would say the comparison has gone too far. To support that point, let me note how the Times image has a different caption at the online paper: Gwendolyn Marie Allen lives in a FEMA trailer near Baton Rouge with her son, who has schizophrenia, and her severely retarded brother, right. The additional information should increase our sympathy for Gwendolyn, but now her brother’s confinement can have very different implications than those of inhumane enclosure, government wastage of human lives, and other elements of the Holocaust analogy. Update: BAGnewsNotes posted on the same photo, same day, each of us not knowing of the other post. There’s a thread running there as well. Next Post →"The Emperor's Clothes …"